national average for achievement in GCSEs, English and maths and apprenticeships and, at The Bedford Sixth Form, our overall A-Level results achievement rates increased to 92.4%. Our excellent staff continued to win awards, with one of our apprenticeship assessors winning the national accolade of TES Assessor of the Year 2018, and in September we were delighted to be granted membership of the Chartered Institution for Further Education under its Royal Charter in recognition of our exemplary position in the sector. Financially, we have also exceeded all expectations and maintained our Outstanding health rating in 2017-18 by turning the combined deficit of £1.6million in 2016-17 to a surplus of £1million in 2017-18. 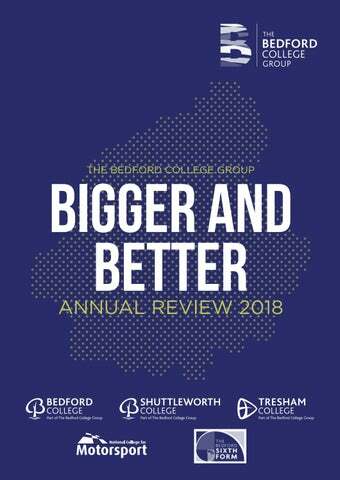 I hope you can take a few minutes to read on and find out more about this truly amazing year for The Bedford College Group. OUR VISION Delivering world class skills and education to the communities we serve. OUR VALUES Our values reflect the manner in which we set out to achieve our aims. We put the student at the heart of all we do. Our three core values are: Student Focus We seek to achieve a high quality learning experience for every student. High Performance We strive for consistently high levels of performance in all aspects of our work. Respect, Openness And Honesty We treat everyone with respect, encourage openness and honesty, and recognise each other’s contribution and achievements. change and improvement from the very start of the merger and this is why they are now seeing such positive results. In particular, the Board is delighted that Tresham College students have seen immediate benefits with improvements in attainment, and recruitment for 2018 increasing by 25% when compared to the previous year. We will ensure that the College continues to provide a high level of education to the local communities in Bedfordshire, Northamptonshire and beyond. Keith Haynes was awarded Assessor of the Year 2018 at the Times Educational Supplement (TES) Awards for his passion, success and commitment to engineering apprenticeships over the past 43 years. The Bedford College Group was granted membership of the Chartered Institution for Further Education under its Royal Charter in recognition of its exemplary position in the sector. In November 2018 full-time 16-18 student numbers stood at 5,7691 against a target of 5,200, representing 11% over achievement. 528 STUDENTS IN 2018 The Bedford Sixth Form on track to achieve its long term targets with 528 students in 2018. HIGHER EDUCATION STUDENT NUMBERS are 8022 compared to 8403 last year. 2,443 APPRENTICES2 Apprentice numbers last academic year managed to approximately remain the same as the previous year, despite the decline nationally of 34%. The Skills Funding Agency has formally confirmed our status as Outstanding for financial health. We are now one of the top 20 financially strong colleges in England. The College has turned the 2016-17 £1.6m deficit into a £1m surplus in 2017-18. The College has secured a £7.5m grant from SEMLEP to redevelop its Wellingborough campus. The College has invested £7.9m in facilities and equipment throughout the year. STAFF DEVELOPMENT 1% of our income was spent on professional development in 2017-18. OUR FUTURE PLANS Engineering Higher Education in Bedford The opening of the brand new Buchanan Centre, the name for the Advanced Engineering & Construction Centre at the Bedford College campus, is just the start of a new journey to offer the very latest in education and learning facilities and equipment. The £5.2 Million Buchanan Centre was funded by generous donations from public and private organisations, the College and £2.5 million from SEMLEP’s Local Growth Fund. In addition, the Higher Education Funding Council England (HEFCE) has given a grant of £170,000 from its Catalyst Fund to develop a range of market-driven Higher Education (HE) engineering courses. £7.5 million Wellingborough campus redevelopment The Bedford College Group has been awarded £7.5million from SEMLEP, through funding available from the Local Growth Fund skills capital investment programme, to redevelop Tresham College’s Wellingborough campus, which will open to students in September 2020. The redeveloped campus, in the heart of Wellingborough town centre, will enable 1,000 additional students to study locally, not just young people but also adult students who want to expand their skills or change careers. OUR FUTURE PLANS New Learning Centre for Corby Following on from the success of the Kettering Learning Centre, which has attracted more than 405 students in just nine months, Tresham College will also be opening a Learning Centre in Corby offering: • Flexible open-learning IT courses for adults • 56 hours of training each week (Monday – Saturday, including evenings) • Pre-bookable 2-hour sessions (minimum of 2 sessions each week) • Microsoft Office 2016 • ITQ Level 1 and ITQ Extended Level 2 • No fees. £3.65 million Zoological Education Centre Shuttleworth College campus is due to open a new Zoological Education Centre in September 2019, the first of its type developed by a further education college. It is being designed in conjunction with the Zoological Society of London (ZSL), who run London and Whipsnade Zoos, and will include an ‘Eden style’ biome with tropical rainforest setting, immersive bio-sphere and wide range of species. Conservation and care will be the key priority, enabling students to learn how to support and care for endangered species. The Centre will put Shuttleworth College firmly on the world map in terms of the education they offer students. OUR STUDENTS COME FROM ALL OVER THE COUNTRY, including Wiltshire and Lancashire. The National College for Motorsport provided us with an excellent service. They took time to see how we operate and understand what the team needs were. I studied Level 3 Animal Management and decided to progress on to higher education. I have been inspired by my tutors sharing their knowledge and degree-level study is opening up lots of doors in the industry and I will certainly top up to the full BSc Degree. Tresham College really opened up my eyes to science and helped me to understand it - it was just fascinating. I finished my Level 3 with a triple Distinction* and Iâ&#x20AC;&#x2122;m now studying BSc Human Bioscience at the University of Northampton. Iâ&#x20AC;&#x2122;m aiming for a First and, if I get this, I want to go on to a PhD. 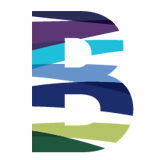 BEDFORD COLLEGE SERVICES Bedford College Services (BCS) is the commercial wing of The Bedford College Group. It is a multi-faceted enterprise that operates across the leisure, hospitality, catering, theatre and facilities hire sectors across the College estate. Munch & Mocha catering venues are on three campuses: Munch & Mocha Bedford, Munch & Mocha Shuttleworth and Munch & Mocha Wixams. We offer refreshments and freshly cooked food to staff and students and also have the capacity to offer catering for external events. The National College for Motorsport won Motorsport Industry Association (MIA) Service to Industry Award for exceptional performance in training young people in race mechanics apprenticeships. Bedford College Public Services course received an Education Ambassador award in the Bedfordshire Police Cohesion Awards in recognition of their work to help students understand the roles of police offices. Tresham Collegeâ&#x20AC;&#x2122;s Keith Haynes won Assessor of the Year 2018 at the national Times Educational Supplement (TES) awards. Tresham College media student Alice Keech won work experience on Radio 1 Scott Mills Show. The Bedford College Group opened a new Learning Centre in Kettering to provide free computer courses in the heart of the town centre. Bedford College graphic design students beat university students for the eighth year running, to win YCN Student Award. Funding was secured for Tresham College’s Wellingborough campus to undergo £7.5 million redevelopment creating courses for 1,000 extra students. A-Level students at The Bedford Sixth Form achieved 99% pass rates. Shuttleworth College confirmed they will be the only UK further education college to have a biome specially designed for tropical creatures when they open their £3.65 million Zoological Education Centre. Official opening of the £5.2 million Buchanan Centre, an Advanced Engineering & Construction Centre at Bedford College Cauldwell Street campus, providing the latest equipment and degree-level training. COMMUNITY The Bedford College Group is woven into the tapestry of the local communities it serves. As part of our Community Engagement Strategy we open up our facilities to ensure our campuses are at the heart of our community. 6,400 LEARNERS have improved their IT skills and gained qualifications since the Learning Centres in Bedford and Kettering opened. A third Centre opened in Corby at the end of 2018. COMMUNITY Who do we work with in the community? How environmentally friendly are we? STUDENTS How do we get students involved in what we do? Where do our student go next? What do employers think about us?